Posh chairman Darragh MacAntony has a lot to think about. Chairman Darragh MacAnthony has revealed star men Marcus Maddison and Michael Bostwick could be among several Peterborough United players to be placed on the transfer list in the summer. 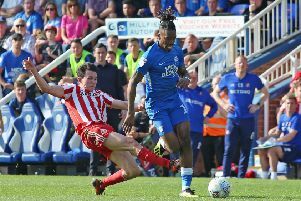 The pair are about to enter the final year of their Posh contracts and club policy dictates they will be transfer listed if they fail to agree a new deal before the start of next season. Posh defenders Jack Baldwin (left) and Michael Bostwick (right) are both about to enter the last year of their contracts. MacAnthony is unsure the club will be able to, or even want to, meet their expected demands. Centre-back Jack Baldwin is another player about to enter the last year of his current deal, while player/goalkeeping coach Mark Tyler and striker Paul Taylor are senior players out of contract at the end of this season. Striker Lee Angol, who is currently on loan at Lincoln City, could also be among those to be listed. Taylor is expected to leave, while Tyler won’t be offered a playing contract next season. Baldwin is expected to sign an extension. Posh striker Lee Angol could be placed on the transfer list when he returns from his loan spell at Lincoln. “There could be a fair few who go on the transfer list,” MacAnthony stated. “Bostwick and Maddison could be among them. I’d love them to stay, but I expect both will want an improved deal. “Bostwick is a great bloke and is settled in the area, but he’s been here six years and we are still in League One. “I love Marcus. He’s a maverick and I enjoy mavericks because they tend to deliver where it matters on the pitch. “But his agent is certain to show me his stats re assists and goals and tell me he is worth a better deal. If we can’t agree a deal with Marcus he will go on the list because we can’t afford to let anyone run their contract down, but I wouldn’t give him away. If it came to it I’d keep him here and tell him he needs to have the season of his life to get the move he wants. “I had a long meeting last weekend (April 16) with Grant McCann and Barry Fry and we discussed how many leaders we have and how many promotion winners there are in the squad. “We discussed what they have achieved in the ‘nitty gritty’ end of the season and what is clear, is we need a shake-up. “Some players haven’t developed into the leaders we expected them to become. “We tried a different approach this season. I wasn’t completely on board with paying bigger wages to more experienced players, but it’s what we agreed as a management team so I went along with it. “The average weekly wage this season is £2,200. It was ‘only’ £1,250 in our promotion seasons. I paid £130k for Anthony Grant in January when we might have got him for nothing at the end of the season. “Yet last Saturday at Coventry was the closest I’ve been to storming into a dressing room after a game. I wanted to pull their beach towels from under them and remind them there were still four games to go. “I do wonder whether we give the players too much. They even have their own chef at the training ground. “Jack Baldwin is a different animal to most though. If the fans knew what he went through to get on the pitch at Coventry they’d be amazed. I don’t think we will have a problem extending his contract as he’s a fair man. “Lee Angol could go on the list, even though he has all the attributes to be a top striker.